Scientists have discovered many bricks of thousand years old in the campus of the Ho Dynasty Citadel in Thanh Hoa province. The Ho Dynasty Citadel Heritage Conservation Centre has announced that in recent archaeological excavations in the campus of the Ho Dynasty Citadel in Tien Vinh commune, Vinh Loc district, Thanh Hoa province, scientists discovered many bricks of thousand years old. The surfaces of these bricks are engraved with ancient Chinese scripts, noting place-names such as Giang Tay (Jiangxi) Quan and Giang Tay Chuyen. This finding helps researchers explain about the origin of the bricks used to build the Ho Dynasty Citadel, a world cultural heritage. These bricks are rectangular, in gray color, with average size of 37x17x5.5 cm, smaller than the popular bricks that were used to build the citadel. Scripts were carved into the bricks when the soil was still wet, scientists said. The researchers said that these bricks were dated back to the Tang dynasty of China (618-907). At that time, every year in the fall and winter, the Tang dynasty sent defensive armies to Linh Nam. They were organised and had the designation of provinces in China, mainly Jiangxi. The colonial government forced soldiers to make bricks and tiles to build citadels. The bricks were carved with the names of the provinces where they were made. The bricks carved with scripts “Giang Tay Quan” and “Giang Tay Chuyen” were produced by troops of Jiangxi Province. At the end of the Tang dynasty, Annam (Vietnam today) was called Tinh Hai Quan. The word "quan" means an administrative unit that is the same as “district” in China. At the Imperial Citadel of Thang Long, similar bricks have been discovered, which existed in parallel with bricks of the Ly – Tran dynasties in Vietnam. Scientists believe that the later dynasties of Vietnam re-used these kinds of bricks to build palaces and fortresses. According to the ancient history book “Dai Viet Su Ky Toan Thu,” Ho Quy Ly dismantled some palaces in the capital of Thang Long to build the An Ton palace in the Ho Dynasty Citadel. In addition to the above bricks carved with "Giang Tay Quan" and "Giang Tay Chuyen", scientists also found out bricks carved with the letter "Dai Viet Quoc." 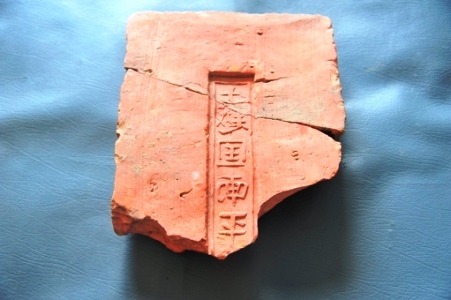 This is the first time this type of brick discovered at the Ho Dynasty Citadel. Most scholars believe that the scripts “Dai Viet Quoc” on these bricks is the country name in the Ly Dynasty. However, according to recent studies, “Dai Viet Quoc” was the name of an independent state founded by Luu Cung in the Five Dynasties and Ten Kingdoms period (907-979). The country name of Dai Viet was created under the Ly Dynasty (1054). Excavations at the ancient capital of Hoa Lu (Ninh Binh province) also found a lot of bricks carved with the letters "Dai Viet Quoc Quan Thanh Chuyen" (Dai Viet bricks for fortress construction). Mr. Nguyen Xuan Toan, deputy director of the Ho Dynasty Citadel Heritage Conservation Center said that the latest discovery shows that the construction of the Ho dynasty citadel attracted the tremendous financial and intellectual resources of the Vietnamese people. "The bricks used to build the citadel are important evidences for researchers to have more grounds in learning about the construction time, construction techniques and the contribution of the people of different regions in the country for the construction of the citadel," Toan stressed.